Looking for a terrific picture of the state of real estate on Seattle's Eastside? Here it is! Since we're at the beginning of a new year, it's good to see where we've been over the last 5 years. It gives a good indication of where we're headed for 2014. The above chart highlights the most important trends in real estate over the last 5 years, from 2009-2013. You can find median pricing, the number of homes on the market and the number of home sales per month and by year, and how long the supply would last, based on the number of home sales per month. Here's how each of the three sections of the chart are set up. Each portion is divided by the years 2009-2013, as you can see along the bottom of the chart. The blue bars show a different month in each of these years. The red line shows the average for the year. The top portion of the chart has the information everyone seems to want to know first, the median pricing. The fabulous news is how much higher median pricing is now than just a few years ago. On the eastside, the average median price for a home sale was just under $600,000 at $596,848. The second chart demonstrates why prices have increased so dramatically. It's the law of supply and demand. The supply dropped considerably in 2012 and and 2013, thus increasing demand for this drastically decreased inventory of homes for sale, causing prices to jump. With the amount of inventory at a low point at the start of 2014, we expect listings to move very quickly. Our first listing of the year sold in 24 hours. The home was not underpriced. It was well priced, staged beautifully, and in excellent condition. This type of home is very "hot" right now, as buyers are looking to find great homes. Another interesting detail to notice on the middle portion of the chart besides the decline in supply, is the number of home sales each year stays more constant, even as the supply changes. The number of sales did increase in the last two years, but not nearly as dramatically as the decline in supply, The increase in sales is a reflection of more buyers feeling comfortable making home purchases. The lower section shows how much of a supply of homes there is available each month. In 2009, when there were, on average 3400 homes for sale, it would have taken over 6 months to sell all the homes. In 2013, when the Seattle Eastside real estate had so few homes for sale, it would have taken 1 1/2 months to sell all the available homes. The take away from all of this is how terrific we find the real estate market to be at the end of 2013, which is the start of 2014 market. We have low inventory plus many buyers equaling a high demand for homes, short market times, and increasing prices. If you plan to make a move in 2014, consider doing so early in the year, when the inventory is at a low point. Homes sell in every month on the eastside as you can see from this chart, the competition is far less when there are fewer homes for sale. If you'd like more specific information regarding your home and/or you're thinking about making a move, feel free to contact us. All the best in 2014! This tells it like it is in the Seattle area real estate market. The entire region, with the exception of Vashon Island in yellow, is a sellers market, which is indicated by the color red. The top sales rate, not the most sales, once again goes to Redmond and East Bellevue near Microsoft. In March, 80% of the homes sold there, while 69% sold in April! The odds of selling a home were the lowest in other parts of Redmond and Carnation. But at 32%, the odds were still good. This is a testament to the positive economy in the Seattle area and on the eastside. Microsoft is hiring and moving people around the country. We know this first hand as we’re working with three different buyers who are either moving into the Bellevue/Redmond area or moving out of state for Microsoft. Multiple offers, a shortage of homes, a huge percentage of homes selling in a short amount of time. some price increases (although minimal) are happening all over the Seattle eastside real estate market. The Seattle Times recently published a very positive picture of the local real estate market. The cities below are reported together to follow our MLS areas (multiple listing service) information. The odds of selling a home were 69%!!!!! The odds of selling a home were 34%. Median sales price increased from $452,000 to $538,000! If you’d like more specific information about your neighborhood or home, feel free to contact either Brooks or me. ** (y-o-y) median pricing is comparing year over year numbers. How was real estate market in your area in April, 2012? Real Estate Sales in Bellevue, Kirkland, and Redmond, Etc Are Hot! 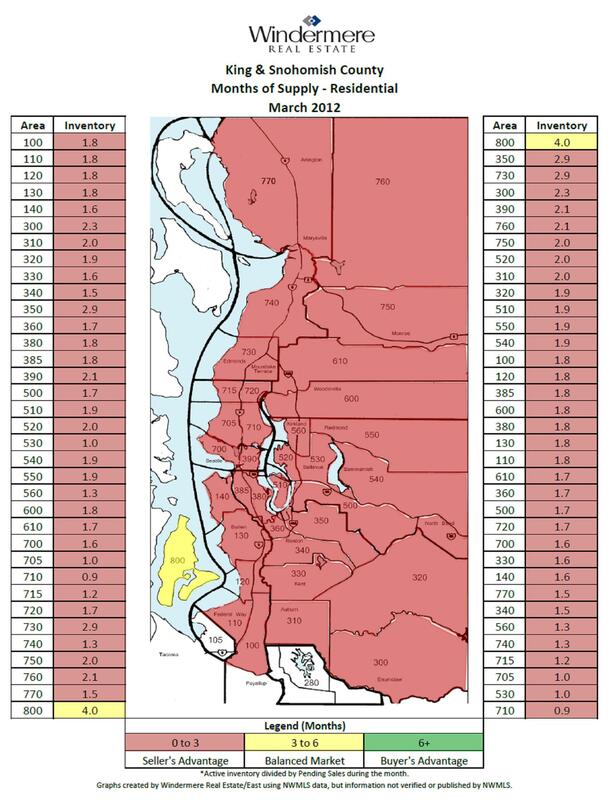 Red is busting out all over the map of Seattle Real Estate Sales! Red means it’s a sellers market in which homes, on average, are selling in less than 3 months! The numbers are really strong in all of the eastside cities, but top sales go to the 80% sales rate in Redmond and East Bellevue near Microsoft last month! Incredible odds! In every other area on the eastside over 40% of the homes sold. Closed sales, the sales in which the new buyer now owns the house, are showing lower sales numbers because the homes that closed in March actually got offers in January or February. Expect the number of sales for each of the coming months to jump higher because March home sales will be closing in April and May.. Market time will continue to decrease as this faster sales market continues. Pricing has still been dropping as you can see below, but should become more stable as the prices from these March sales becomes public. Some areas actually showed an increase in pricing, but remember, it is a representation of the sales that sold in March only. Multiple offers, a shortage of homes, a huge percentage of homes selling in a short amount of time are all the buzz words for the Seattle eastside real estate market. The odds of selling a home were 46%. How was real estate market in your area in March, 2012? How Was The Real Estate Market In Bellevue, Kirkland, Redmond, and Other Eastside Cities At The Start of 2012? What a difference a month makes! The January Real Estate Map shows a “Seller’s Advantage” in our market! There’s a lot of “red” on the above Seattle area real estate map! There’s more “red” than we’ve seen in years, and I mean years. What does the “red” mean? It means it’s a seller’s market. The homes that are in the “red” areas sell in less than 3 months on average. In January, most of the eastside was a seller’s market. Mercer Island, West Bellevue, and Kirkland did not quite reach the threshold of a seller’s market, but Kirkland was almost there. The real estate markets in these areas were more evenly balanced between the buyers and sellers as homes sold on average within 3-6 months. This real estate market is pretty exciting to see after the tough markets of the last few years. But what this really means is that we have a more normal market on Seattle’s eastside. The good homes that are priced right and show well are the homes that are selling quickly and bringing the average market time down. There are and still will be homes that aren’t priced well or don’t show well which will sit on the market and take longer to sell. The chance of a home selling in the different eastside cities ranged from 15-30%. West Bellevue had the fewest sales when compared to the number of available homes, while the plateau cities of Sammamish, North Bend, and Fall City saw almost a third of the homes sell in one month! The Seattle Times talked about the drop in median prices, but was careful to point out that data varies from city to city and neighborhood to neighborhood. But King County is a big place, and the real-estate market isn’t the same in SeaTac as it is in Sammamish. A closer look at the statistics reveals significant variations from neighborhood to neighborhood. It’s good to see the Times recognizing the neighborhood differences, since too many times the media publishes data, which covers too broad an area. This does not give an accurate picture of the real estate data. The cities below are grouped together to follow our MLS areas (multiple listing service). This is how our statistics are reported. 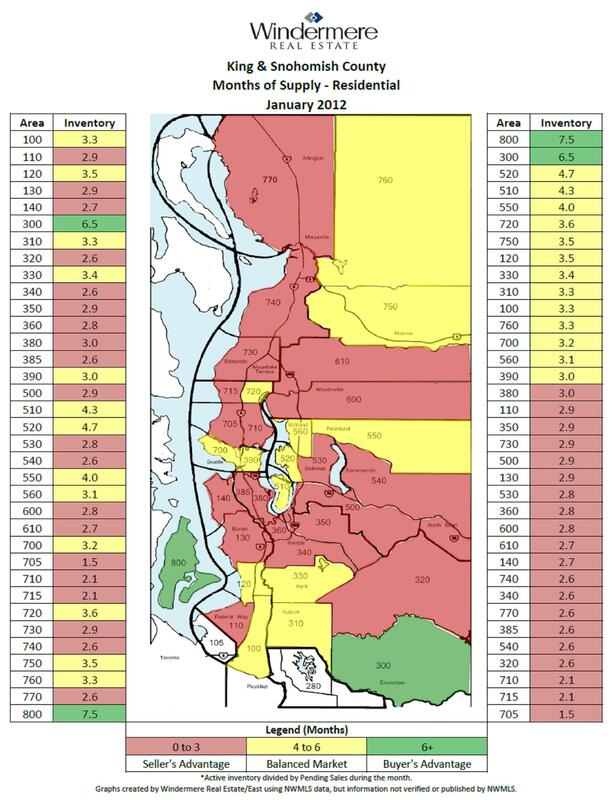 How was real estate market in your Seattle-Eastside city in January, 2012? The odds of selling a home were 15%. How Was The Real Estate Market In Your Seattle-Eastside City in December 2011? How was real estate market in your Seattle-Eastside city in December, 2011? The odds of selling a home were 10%. How Was The Real Estate Market in your Seattle-Eastside City in November 2011? If you lived in Kirkland and had your home for sale last month, the odds of it selling in November were 31%, the strongest absorption rate to be found on the eastside. * The homes in East Bellevue and Redmond areas around Microsoft had a 29% chance of selling. Chances of selling ranged from 11-22.5% in the other eastside cities. Homes in East Bellevue and Redmond near Microsoft sold the fastest on Seattle’s eastside. On average, homes there sold in 2 months. Market time for the other eastside cities, ranged from 3 to 4 months. This is reasonable market time, indicating a balanced market between buyers and sellers. A balanced market means there’s a more normal market. Some homes sold quickly and others stayed on the market for a long time. Some homes sold for full price and others sold at steep discounts. How was real estate market in your Seattle-eastside city in November, 2011? Median price decreased (y-o-y)** from $530,000 to $477,000. 188 homes were for sale. A total of 58 homes sold. The odds of selling a home were 29%. Median sales price decreased to $418,000 from $527,000. A total of 48 homes sold. The odds of selling a home were 22.5%. Median price increased from $538,000 to $550,000. 267 homes were for sale. A total of 60 homes sold. 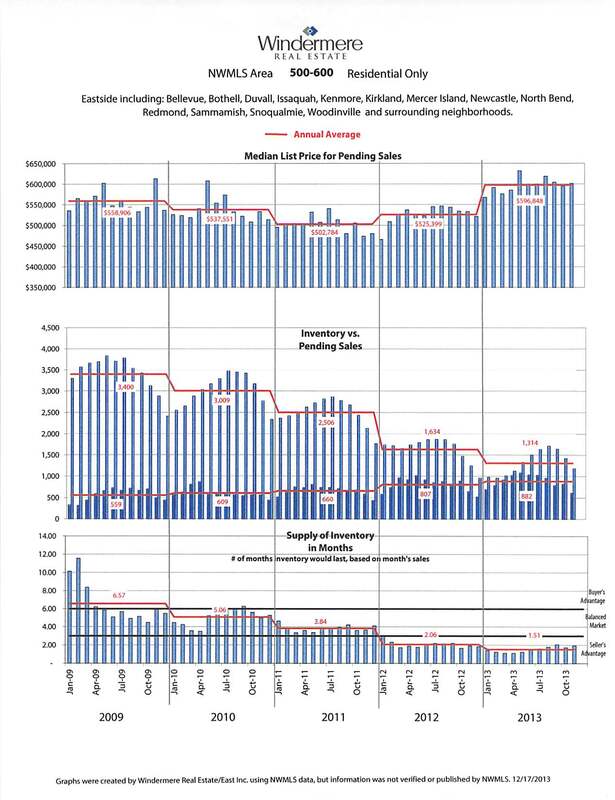 Median pricing decreased from $540,000 to $530,000. 247 homes were for sale. A total of 54 homes sold. The odds of selling a home were 22%. Median price was down from $451,000 to $394,000. 481 homes were for sale. A total of 105 homes sold. The odds of selling a home were 18%. Median sales price decreased from $460,000 to $441,000. There were 580 homes for sale. A total of 104 homes sold. The odds of selling a home were 11%. Median pricing decreased to $950,000 from $1,035,000. 127 homes were for sale. A total of 14 homes sold. Were there a lot of Distressed Real Estate Sales on the Eastside? My last post focused on distressed sales in the counties around Seattle, a huge area. This post focuses on the eastside cities across Lake Washington from Seattle. The hardest hit area for distressed property sales on Seattle’s eastside is what we Realtors call area 600 (see bottom of the chart above) which encompasses north Kirkland, Juanita, Duvall, Woodinville, Bothell, and Kenmore. Although all of these communities are fairly close to the eastside employment centers, the commute can be longer for many people. Parts of Woodinville and Duvall are still fairly rural in nature. Rural areas around Seattle have been hit harder with the decline in the real estate market. The higher number of distressed sales in these areas fits this model. More people want to live closer to work these days. The area with the fewest number of distressed home sales was Mercer Island (area 510). Mercer Island is also one of the more expensive eastside cities. Situated between the eastside communities and downtown Seattle, it’s a desirable place to live. It’s a bedroom community located near the top economic centers with top notch schools and an easy commute to Seattle and the eastside. Kirkland (area 560) is a very desirable location because it has good highway access, is close to jobs, and has a good school system. But the city has the second highest rate of distressed sales, which is surprising. The community encompasses a variety of housing styles and prices.from multi-million dollar waterfront homes to starter homes in the $200,000+ range. The other eastside cities of Bellevue, Sammamish, Issaquah, and the closer in neighborhoods of Redmond, near Microsoft, had distressed sales ranging from 16-19% of the total real estate sales in the third quarter of 2011. The theme here as in the last post is close-in locations near jobs is the better place to be. The eastside cities that fit this bill had the least amount of distressed sales. Seattle-eastside real estate sales results were so similar during June, July, and August I could have posted the same report with just a few exceptions each month! Overall, 23% of the available homes sold in August, the same as June and July! The only significant change happened in West Bellevue and East Bellevue and the Microsoft area around Redmond. Both these areas had fewer home sales in August than in July. It was most noticeable in the neighborhoods around Microsoft where sales have been consistently strong. In July, 38% of the homes sold and in August the sales numbers dropped back to 24%. The area still had the best return on the eastside, but it was more in line with other eastside neighborhoods. There’s a good real estate market out there. The last time we saw a similar real estate market was back in the years between 1998-2002. The market during those years was what we considered to be a “normal” market, not a crazy market. Once again, we see a more “normal” market today. How many homes sold in August, 2011 in your neighborhood? The odds of selling a home were 21%. Median sales price dropped: $479,895 to $475,000. There were 725 homes for sale. A total of 174 homes sold. The odds of selling a home were 24%. Median sales price decreased from $494,900 to $479,950. 367 homes were for sale. A total of 94 homes sold. The odds of selling a home were 23%. Median price was down from $415,000 to $381,650. 589 homes were for sale. A total of 148 homes sold. The odds of selling a home was 22%. Median price decreased from $641,000 to $595,000. 280 homes were for sale. A total of 73 homes sold. The odds of selling a home were 17%. Median pricing decreased from $869,000 to $754,500. 169 homes were for sale. A total of 40 homes sold. Median pricing decreased from $549,950 to $534,900. 319 homes were for sale. A total of 79 homes sold. If you’d like more specific information about your neighborhood or home, feel free to contact me. How Many Homes Sold in Your Seattle-Eastside Neighborhood in July, 2011? How many homes sold in June, 2011 in your neighborhood? It’s uncanny to see how similar July real estate sales on Seattle’s eastside were to June’s sales results. On most of the eastside, the numbers varied only slightly from June. Twenty-three percent of the homes for sale on the eastside sold, with the Redmond and Bellevue area around Microsoft leading the way with 38% of the homes selling. In the majority of eastside neighborhoods, the chance of selling a home ranged between 20-23%. The odds of selling a home were 20%. Median sales price dropped: $539,950 to $519,000. There were 771 homes for sale. A total of 165 homes sold. The odds of selling a home were 38%. Median sales price increased from $422,475 to $429,950. A total of 85 homes sold. Median price decreased from $599,475 to $578,500. 380 homes were for sale. A total of 110 homes sold. Median price was down from $499,950 to $369,475. 598 homes were for sale. A total of 158 homes sold. The odds of selling a home was 23%. Median price decreased from $549,900 to $541,500. 288 homes were for sale. A total of 76 homes sold. Median pricing decreased from $1,299,000 to $1,074,475. 175 homes were for sale. A total of 42 homes sold. Median pricing increased from $548,000 to $549,000. 337 homes were for sale. A total of 75 homes sold. How Many Real Estate Sales Were in Your Seattle-Eastside Neighborhood in June, 2011? June continued to be a strong month for real estate sales on Seattle’ eastside. In fact, June may have been the strongest month for real estate sales on Seattle’s eastside in four years. The Puget Sound Business Journal stated more homes sold this month than in recent months. Every area did far better than previous months and previous years. The Redmond and Bellevue area around Microsoft led the pack with almost 40% of the homes selling. Almost every other area had a minimum of 20% of the homes selling. More homes are selling than we’ve seen in years, but there are still a lot of homes that are languishing on the market. Know your competition, so your home will land in the 20%+ homes that are selling. A past client of mine is moving back to the eastside after about 5 years. He was really surprised to hear that the homes near Microsoft are actually more affordable than those in South Bellevue. The Bellevue Schools are getting a lot of press because several of the high schools are landing on top 100 lists of the top high schools. But in reality, parts of Bellevue have been more expensive for years because of the easy I-90 access to Seattle. This may explain why the area around Microsoft is usually the hottest real estate market. It’s a great location, close to jobs, has good schools, and slightly more affordable housing prices. Median sales price dropped: $525,000 to $494,950. There were 765 homes for sale. A total of 190 homes sold. Median sales price decreased to $449,900 from $482,500. 364 homes were for sale. A total of 91 homes sold. Median price was down from $419,973 to $369,950. 572 homes were for sale. A total of 147 homes sold. The odds of selling a home was 19.5%. Median price decreased from $624,950 to $535,000. 286 homes were for sale. A total of 71 homes sold. Median pricing decreased from $890,000 to $719,950. 181 homes were for sale. A total of 43 homes sold. Median pricing increased from $474,950 to $549,900. 331 homes were for sale. A total of 77 homes sold.